Natural pigments article - do natural pigments offer more to the modern painter? Toxic, very bright orange/red pigment made by heating lead. This is a heavy jar of pigment with an extremely zingy, bright orange hue. The only other pigment in my collection that comes close in terms of brightness is cadmium orange. transparent blue-ish red, traditionally made from madder root, but largely superseded by a synthetic version since the 19th century. There seems to be a lot of debate relating to the lightfastness of alizarin crimson. I am somewhat concerned about the reputed reaction that this pigment has to light, however I have found it to be a useful colour, being a beautiful deep red and transparent in nature. 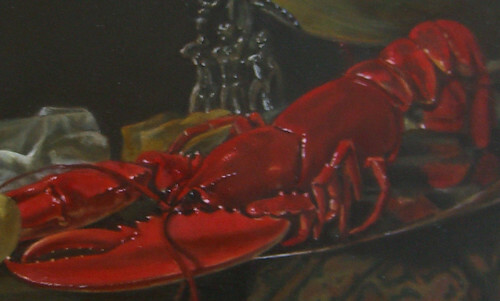 I have used tiny amounts of Alizarin in flesh tone mixes, in the darker areas of my lobster painting and as a glaze over an umber underpainting in the tablecloth of my 'still life with books' (see below). I find Vermillion to be a useful colour, though many people these days prefer cadmium red. Nothing else in my collection occupies quite the same middle ground between bright orange and pink. 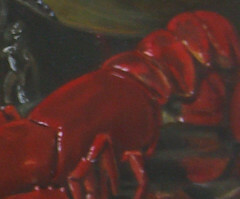 I have used Vermillion in flesh mixes and also quite prominently in the lighter areas of my lobster painting (see below). My jar of pigment shown in the above pictures is still in mineral form, yet to be ground to a powder. If you have any comments about this page, or would like to add material or suggest additional resources that should be listed to here, please feel free to post a comment. This page is intended as a way of sharing a collection of useful links and resources that I have found over the years, relating to the use and history of raw pigments. I hope that this page will be a useful launch pad for anyone wanting to delve more deeply into the uses and characteristics of different pigments.